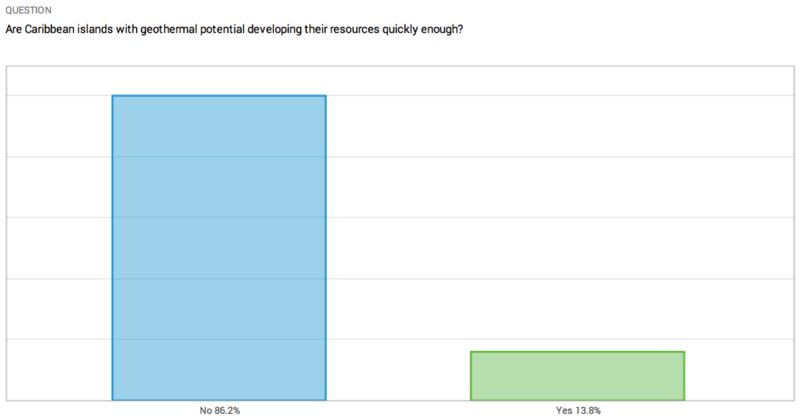 In a market-wide poll taken at the 2016 Caribbean Renewable Energy Forum (CREF), delegates overwhelmingly responded that islands are not acting quickly enough to develop their geothermal resource. While regional progress has been closely tracked – particularly the uptick in the past year – we have yet to see proven steam. Montserrat is digging its third well, and sharing weekly progress. More islands have joined forces with developers, including Antigua and Barbudaand St. Lucia, but perhaps the most compelling advancement in recent months comes from Dominica. Dominica is bucking the trend of the private public partnership model and going it alone to develop a 7 MW geothermal plant. They have teamed up with experts from the New Zealand government for technical expertise and “have sought the World Bank’s support for developing the geothermal operation, presently under consideration for inclusion in the Bank’s lending pipeline,” said World Bank Senior Energy Specialist, Migara Jayawardena. The World Bank, which is already providing advisory support to the geothermal development effort in Dominica through technical assistance, has a funding package of up to $50m at the table which will likely still be included. Geothermal by its very nature has a longer lead time than a solar or wind project. In the Caribbean, however, things can take even longer when you’re shipping in infrastructure and setting up a new – and remote – supply chain. Many projects in the region have several of the components needed to move forward – a proven resource and a private developer, for example – none as yet have all. The survey at CREF suggests that a push to drive these projects to close would be warmly received by the market.